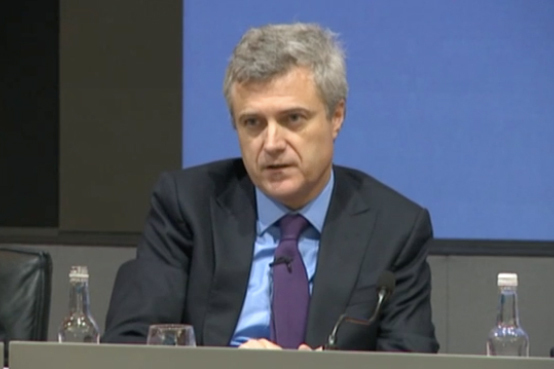 Mark Read has said WPP needs to focus more on clients and less on how it organises itself. WPP’s joint chief operating officer said in an interview with Campaign that the group needs to be more collaborative and admitted former chief executive Sir Martin Sorrell’s strategy of horizontality – getting agencies to work together – needs help. "Perhaps horizontality was too much about bringing ourselves together, not about what is the right solution for the client," Read said. He was speaking after he joined fellow joint chief operating officer Andrew Scott, group chief transformation officer Lindsay Pattison, executive chairman Roberto Quarta and group finance director Paul Richardson for a presentation to investors. It was the first time WPP has reported results since Sorrell abruptly quit on 14 April over allegations of personal misconduct, which he denied. The group is now looking for his successor. Read has said he would like the job. WPP pleased investors when it announced revenues less pass-through costs slipped only 0.1% in the first quarter – the best performance in four quarters. WPP’s share price tumbled by a third over the last year but bounced back, rising about 8% after the Q1 results. Read told investors: "We're facing a period of structural change, not structural decline." Scott said the group had an "open mind" about selling assets, such as data arm Kantar, and was likely to look at disposing of minority stakes in other businesses. Campaign: How will you and Andrew Scott as joint COOs be different as leaders from Sir Martin Sorrell? Read: "Martin always said whoever came after him would run the group in a different way. We’d rather focus on what we are going to do, rather than focus on what’s different from what Martin did. "We recognise the group has some challenges or our revenue growth would be stronger. If the goal is to bring the group closer together, then we need to run it in a collaborative fashion with the people that lead our businesses. That will be the direction we go in." Is there such a thing as a WPP management board? If not, should there be one? Because as far as we know there isn’t such a thing where the leaders of the leading operating companies sit and meet together. "We are going to look at how we run the business and what the right structures are in place that enable us to balance it most effectively. That’s a way of not answering your question, but answering it." "We need to focus on our clients, not on ourselves. Perhaps horizontality was too much about bringing ourselves together, not about what is the right solution for the client." Pattison also said that WPP was "behind" rival ad groups when it came to its "narrative". What’s the new narrative for WPP, even though we are in a limbo period? "The email we sent out [to staff last week, outlining the need to get closer to clients], starts to describe some of what it is. "I don’t feel like we are in a limbo period. Roberto [Quarta, the executive chairman] made clear when someone was asked a question about whether there is going to be one strategy or two strategies or an evolution of strategy… there’s no one single bullet in terms of getting the business back growing. There’s a number of things to do across the company. We’re just getting on with working on those. "The new narrative, such as it is, is becoming closer to our clients, becoming closer together, putting data and technology more at the heart of what we want to do – more about clients, rather than [internal] organisations." You told investors that embedding data and technology more deeply across WPP is important. Has the existence of WPP Digital, which you oversaw, been a strategic mistake because it was by definition siloed and not embedded across the group? "That’s a misconception of what WPP’s digital strategy was. We always said our goal was to embed digital in all of our agencies and to ensure we move quickly by making investments inside WPP Digital. "What we did at WPP Digital didn’t in any way distract from what the agencies were able to do. It was more to make sure we didn’t miss out on opportunities [that] we did both. "We didn’t want to say, do we digitize our traditional businesses or do we grow in the new, digital businesses? We always said it’s too important – we have to do both. "One of the challenges was our structure and metrics and reporting didn’t make it as easy as we would have wanted to give the rest of the group access to the assets inside WPP Digital. "One of the things we need to do in future is make sure it’s easier to agnostically access everything you need and we don’t let [agency] P&Ls and silos get the in the way." You and Paul Richardson, the group finance director, both said in the presentation that North America is an on-going weakness for WPP. You didn’t identify any specific cause. But did the fall-out of the ANA media transparency investigation across the industry in 2016 harm your business? Is this why revenues have been falling? "I didn’t say no effect. A number of our businesses grew more slowly in north America than they did in other parts of the world. Clearly, in Group M [the WPP media-buying division] there were a couple of reviews where we were not successful. "If you said the ANA report engendered the media reviews, you can make the link that way. I don’t think you can make the link the other way. "The business overall didn’t grow across the board. It was worse in the creative agencies and the custom parts of the market research business." Unlike in some other leading markets, WPP doesn’t have a country manager in North America. Is it important to have a country manager there? "I don’t know that we need to, given all of the leadership [already] in place. I do worry about putting in too many layers of management. I think we need to have structures where people can collaborate without having people sitting on top of them to help them to collaborate. "North America is different in that respect and if we can simplify the group and have fewer moving parts, then it’s easier for us to manage the ones we have and get them to collaborate more." You have spoken to all of your top 20 clients since Sorrell quit. When it comes to pitching for new business, how much was Sorrell the secret sauce that helped WPP to win? "Martin was important and there will be times when I need to play that role. But he wasn’t the only reason we won new business. "Different holding company CEOs play different roles. I think you need to lead from the front in this industry. Ultimately it’s the work that should speak for itself – not just your relationships." You said you’ve been encouraged by the response from clients. How destabilizing is it for staff if subsidiaries are up for sale? Or is it a positive? "People who knew Martin are sad to see him leave the company but they work in operating companies that have strong leaders of their own and typically they are the people they work with day to day and get on with. "If people read the press too much, they may have concerns. When I go to the offices, people are getting on with work and are confident about the future. If we emphasise what we can do, they’ll be fine." Are you and Andrew Scott having fun as joint COOs? Is it exhausting? "We’re positive. I’m smiling. I wouldn’t say enjoying it is necessarily the right word. "You should enjoy what you’re doing. If you don’t enjoy it, you shouldn’t do it. All of us at WPP should feel like we come into work and I’m not saying have fun but feel good about what we’re doing." You mentioned in your presentation the continuing importance of creativity as a differentiator and how you expect more creative management consultants to attend Cannes Lions this year, even if the traditional ad groups cut back. Is WPP going to be out in force in the same way at Cannes compared to previous years? "We are still very focused on entering awards. Given the way Cannes has restructured their categories, it’s unclear exactly how many awards we’ll enter compared to last year. "We are totally committed to trying to do our best and trying to win again. As for the number of people there, we need to be cognisant of the cost but there are a lot of clients there. So we’ll be there working with our clients and celebrating what makes our industry unique."